Resolve to Save in REAL MONEY, Not Trashy Cash! I'm inviting you today to join nearly 3,000 other Money Metals Exchange customers and get on our monthly plan! Monthly Dollar-Cost Averaging: The Surest Way to Manage Market Volatility! 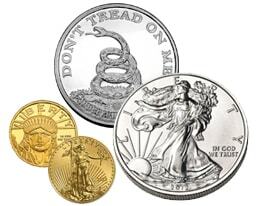 The Most Gold and Silver for Your Money – Barely above Melt Value! Stop, Re-start, or Sell Back Any Time You Wish – No Hassles! By participating in Money Metals Exchange's Monthly Gold and Silver Accumulation Plan, you can put your savings plan on autopilot and ride the precious metals bull market. Start Right Now, and You Will Also Take Advantage of the Lowest Gold and Silver Prices in More Than 3 Years! Simply complete your enrollment online and look forward to hassle-free precious metals investing, because everything is automatic. You establish a monthly purchase date of your choosing and just let things run on autopilot, until you decide you want to make a change. If you're still relatively new to precious metals, the Monthly Savings Plan allows you to get your feet wet and enter the market safely and smartly. Start with an amount that is comfortable for you and cancel any time. The minimum to get started is only $150 a month. This amount fits most budgets, yet it's meaningful enough to grow a nice stash of cold, hard gold and silver in just a few months' time. It creates financial discipline, which leads to secure, long-term wealth. You'll feel deep satisfaction each month because your wealth in beautiful and enduring gold and silver gets bigger, helping to protect your family's future. It provides the potential for profit. Most experts expect the most explosive gains in gold and silver lie ahead of us. Can you say that about the dollars in your savings account? Most importantly, you are in complete control of our Monthly Gold and Silver Accumulation Plan. If your personal asset-protection goals become more ambitious, you can raise your purchase amount. You can adjust it each month, put it on hold, or cancel at any time. You may purchase gold or silver – or purchase both. It only takes 2-3 minutes to enroll. Sign up online right now! No bank account or credit card is even required to get started (unless you prefer). We can certainly just invoice you each month. Most folks, however, prefer to have their bank account debited for a fixed amount each month because that way purchases happen automatically and on schedule. Thousands of satisfied Monthly Savings Plan customers agree that Money Metals Exchange's system is safe, secure, and gives them the combination of control, easy accumulation, and automatic dollar-cost averaging that they can't find anywhere else. Establish your savings plan today by filling out this simple online form, get on your own gold and silver standard, protect your buying power, save in real money… and impose a measure of accountability on Washington and the Federal Reserve! Start Your Gold and Silver Savings Plan Today! Clint Siegner is a Director at Money Metals Exchange, a precious metals dealer recently named "Best in the USA" by an independent global ratings group. A graduate of Linfield College in Oregon, Siegner puts his experience in business management along with his passion for personal liberty, limited government, and honest money into the development of Money Metals' brand and reach. This includes writing extensively on the bullion markets and their intersection with policy and world affairs.